The crown of the main tower of the Church of Our Lady of Guadalupe, also known by many locals as the Cathedral of Puerto Vallarta, has a Baroque style design, and a replica of the crown that Empress Carlota owned, wife of Maximiliano of Habsburg, Emperor of Mexico from 1864 to 1867. 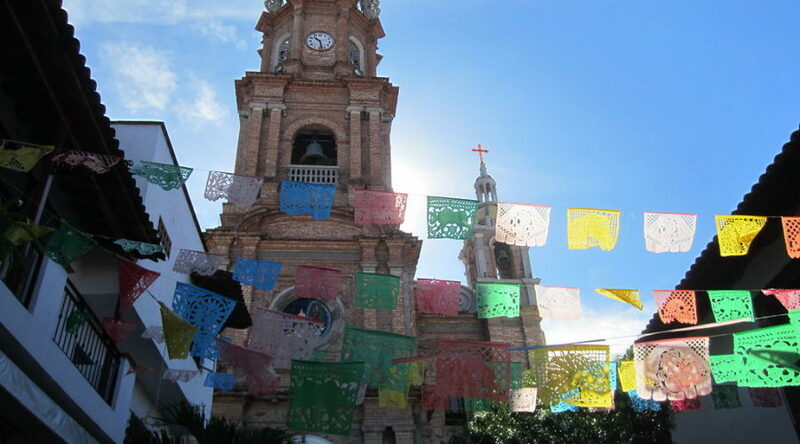 The history of this temple begins at the beginning of the 20th century when the foundations were laid for the construction of the first church in Puerto Vallarta. At the beginning, it was a small chapel created with a dedication to the Virgin of Guadalupe, until Father Francisco Ayala arrived in the port in 1915, who suggested making the construction in tribute to the original Basilica of Guadalupe in Mexico City. The construction ceased to be a chapel when its official use as a parish was declared. Its construction was stopped due to the Cristero War and resumed years later when they added the upper dome and the choir with its organ, installed on the 420th anniversary of the apparition of the Virgin of Guadalupe in accordance with the Mexican Catholic tradition. Finally, in 1952 the main tower was finished, however, the crown symbol that has defined the parish wasn’t installed until 1963. The facade of the towers was completed in 1987. As the local headquarters of the Catholic faith, the temple offers religious services for residents and tourists, including mass in English, French and bilingual mass every Saturday and Sunday. Their bells ring 30 to 15 minutes before each mass defining part of the sounds that make up the culture of the town of Puerto Vallarta. This ringing is especially appreciated during the religious festivities that are organized the first twelve days of December for the commemoration of the Virgin of Guadalupe, attracting pilgrimages from locals and tourists in a colorful and joyful celebration that fills the senses with the songs, food, colors and aroma of the port breeze that dissolves with the flowers that are offered. The Church of Our Lady of Guadalupe of Puerto Vallarta is not limited to the exterior of the temple, because inside the church, religious works of art are housed, such as the stations of the Via Crucis, modeled in plaster, placed between columns of Ionic capital and fluted shaft; the pulpit and the confessionals of carved wood, the marble altar with gold leaf, the images of saints in lacquered wood, and the altarpiece of Our Lady of Guadalupe painted by the Jalisco artist Ignacio Ramírez. This religious gallery is literally crowned with the imperial symbol that defines the Puerto Vallarta skyline: the crown, supported by eight concrete angels designed by the sculptor J. Esteban Ramírez Guareño, and which is currently a version made of fiberglass , because the original, concrete crown, succumbed to its own weight during the earthquake of October 9, 1995. Present in postcards, books and tourist reviews of the city, this temple with its tower and its unique crown, has become a distinctive symbol of the city for those who know Puerto Vallarta and for those who do not know it. It is worthwhile to admire it up close and inside. It is an essential stop during your vacation in Puerto Vallarta.